Intracellular location of PfSec31p and effect of BFA treatment on export of PfSec31p. Erythrocytes infected with ring stage (a,b,i) or mature (c,d,j-l) malaria parasites (K1 strain) were labelled with affinity purified rabbit anti-PfSec31(WD) antiserum (a-d) or affinity purified rabbit anti-PfSec31(int) antiserum (i-l) followed by a fluorescein-conjugated anti-rabbit IgG. Transmission images of a-d are shown in e-h. 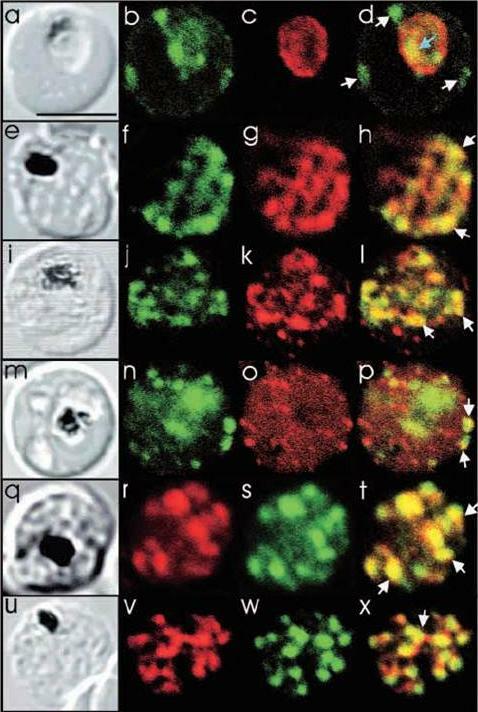 Transmission images of i-l are shown in m-p. Optical slices were collected by confocal microscopy through the centre of the parasite (a,i,j) or near the surface of the parasitised erythrocyte (b-d,k,l). In (a) and (i), some PfSec31p-containing structures in the erythrocyte cytosol are marked with white arrowheads. A PfSec31p-containing structure in the parasite cytosol in (a) is marked with a blue arrowhead. Erythrocytes infected with synchronised ring stage parasites (FAC8 strain, 2-10 hour rings) were incubated for 18 hours in the presence of 5 mg ml-1 BFA (q,r) or an equivalent volume of methanol (s,t). Smears were prepared for immunofluorescence microscopy and visualised using affinity purified rabbit anti-PfSec31(WD) antiserum. 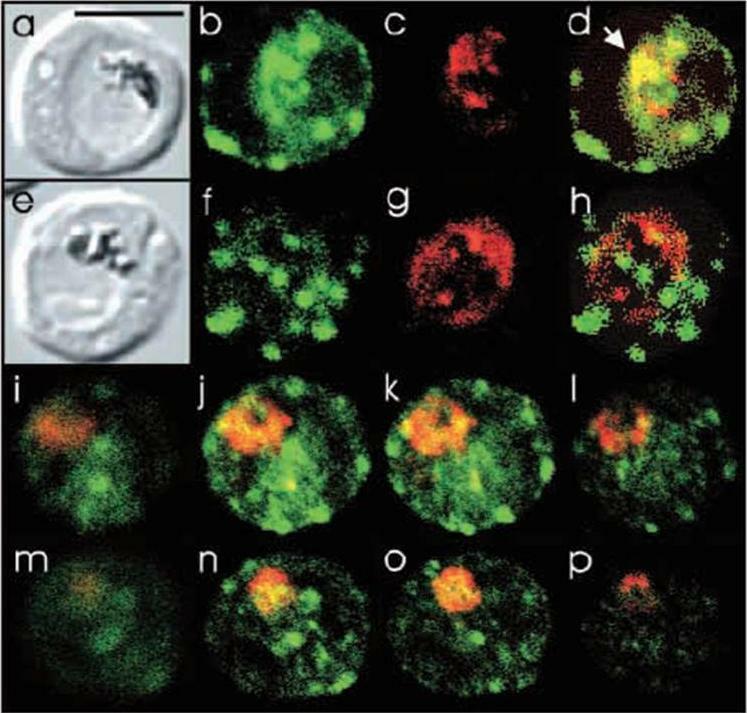 Bar in (a), 5 mm.Adisa A, Albano FR, Reeder J, Foley M, Tilley L. Evidence for a role for a Plasmodium falciparum homologue of Sec31p in the export of proteins to the surface of malaria parasite-infected erythrocytes. J Cell Sci. 2001 114(Pt 18):3377-86. Comparison of the location of PfSec31p with that of other parasite antigens in P. falciparum-infected erythrocytes. (a-d) Asynchronous infected erythrocytes (K1 strain) were probed with affinity-purified rabbit anti-PfSec31(WD) antiserum followed by a fluorescein-conjugated anti-rabbit IgG (b; green fluorescence) and a murine monoclonal antibody recognising the PV-located protein Exp1 followed by rhodamine conjugated anti-mouse IgG (c; red fluorescence). An optical slice was collected through the centre of the parasite by confocal microscopy. Some PfSec31p-containing structures in the erythrocyte cytosol are marked with white arrowheads and a PfSec31p-containing structure in the parasite cytosol is marked with a blue arrowhead (d). (a) A transmission image of (b-d). (e-l) Asynchronous infected erythrocytes (K1 strain) were probed with mouse anti-PfSec31 (WD) antiserum followed by a fluorescein-conjugated anti-mouse IgG (green fluorescence) and a rabbit anti-PfSar1p antiserum followed by Alexa-Fluor-568-conjugated anti-rabbit IgG (red fluorescence). 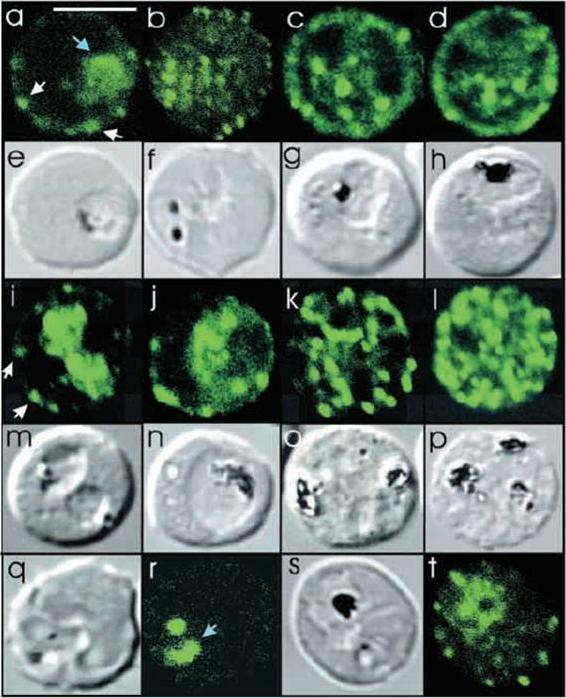 Optical slices were collected near the surface of the parasitised erythrocytes. Some PfSec31p- and PfSar1p-containing structures are marked with arrowheads. (m-p) Asynchronous infected erythrocytes were probed with affinity-purified rabbit anti-PfSec31( WD) antiserum followed by fluorescein-conjugated anti-rabbit IgG (green fluorescence) and a murine monoclonal antibody recognising PfEMP3, followed by Alexa-Fluor-568-conjugated anti-mouse IgG (red florescence). An optical slice was collected near the surface of the parasitised erythrocyte. Two structures in which there is partial overlap of PfSec31p and PfEMP3 in the erythrocyte cytosol are marked with arrowheads. (q-x) Asynchronous infected erythrocytes were probed with a mouse anti-PfSec31(WD) antiserum followed by Alexa-Fluor-568-conjugated anti-mouse IgG (red fluorescence) and an affinity-purified rabbit anti-PfEMP1 antibody followed by fluorescein-conjugated anti-rabbit IgG (green florescence). Optical slices were collected near the surface of the parasitised erythrocytes. Some PfSec31p- and PfEMP1-containing structures in the erythrocyte cytosol are marked with arrowheads. 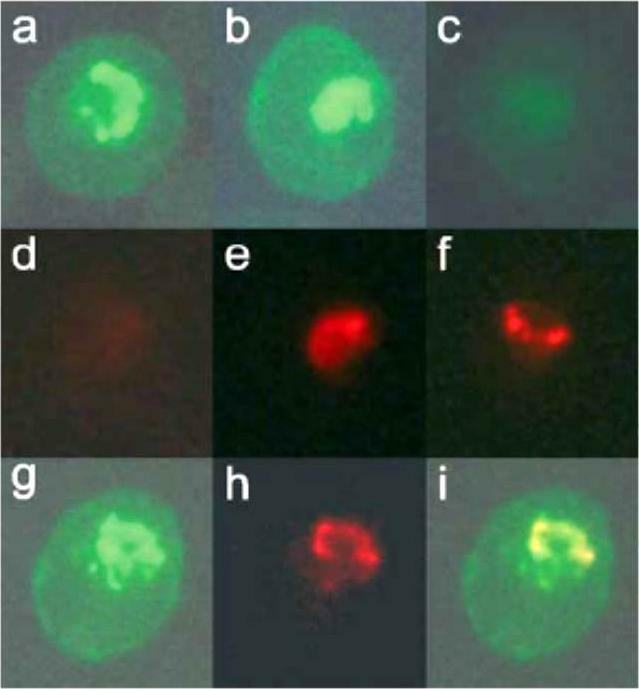 Bar in (a), 5 mm.Adisa A, Albano FR, Reeder J, Foley M, Tilley L. Evidence for a role for a Plasmodium falciparum homologue of Sec31p in the export of proteins to the surface of malaria parasite-infected erythrocytes. J Cell Sci. 2001 114(Pt 18):3377-86.